Introduction and Objectives: Prehospital emergency care is a part of healthcare delivery systems. Despite the high incidence of road traffic injuries and socioeconomic consequences and importance of the quality of early interventions on the scene, few studies have been conducted in this field. 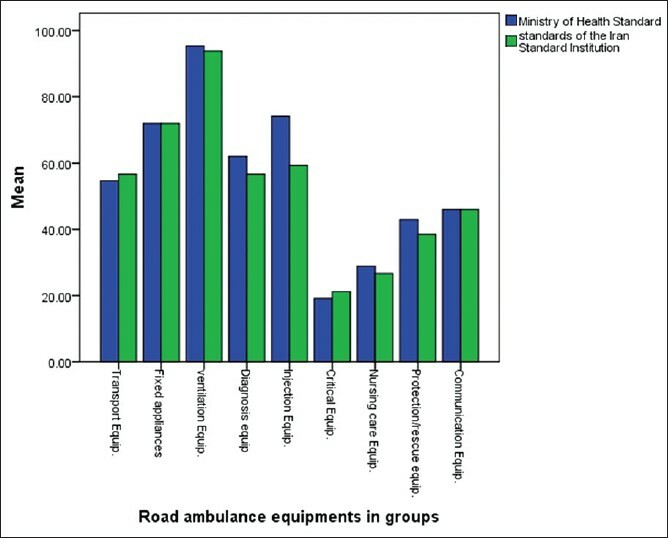 This study was conducted to compare road ambulances equipment based on the national standards in Guilan province. Subjects and Methods: This is a descriptive, cross-sectional/analytical study in 2012 and its population included all active province relief road centers' ambulances. Data collection tools included merged checklists that was completed by the researchers which referred to all relief road centers. Data collections were performed using census method and analysis of data by using descriptive and analytical statistics. Results: The overall average road equipments of ambulances of Guilan Province, according to standards of Ministry of Health (MOH) and Iran's Standard National Organization was about 51 and 49%, respectively. The average equipments according to the two standards, in fixed appliances group: 72 and 72%, the equipments of respiration/ventilation: 95.3 and 94%, diagnosis group: 56.6 and 62%, injection/drugs: 74 and 59%, equipments of treatment critical management: 19 and 21%, nursing care/bandage: 29 and 26.6%, and protection/rescue were 43 and 38.5%, respectively. According to results and according to the two standards, 76.7 and 66.7% of ambulances had all equipments related to airway/ventilation management, respectively. Conclusion: The best state of ambulance equipments was related to the airway/ventilation management and the poorest state of facilities was about equipments of treatment critical management, that it is very important. The deficiencies of emergency ambulance equipments reduce the efficiency of emergency road performance, therefore, it seems eliminating the deficiencies in ambulances equipments and achieving the national standards is essential. Introduction: The best strategy for implementing rural insurance program in the form of referral system is "Family Physician". Since, there were both background and culture of referral system in the villages, the researchers decided to implement the mentioned program at first in the villages. This study intends to evaluate the insured errors through Failure Mode and Effects Analysis (FMEA) model. Materials and Methods: The present research is applied one, the study type is cross-sectional, and it is an action research (using Delphi technique, nominal group, and brainstorming). The population of the study consisted of the experts in the villages and towns populated under 20,000 employed at Isfahan Medical Services Insurance Organization and also experts of Health Centers in the province and number one townships. Sample size and sampling methods were 17 selective accessible in time and place. The research data was collected through a worksheet which was made according to the identified errors. The validity of FMEA worksheet has been confirmed by the experts and its reliability has been approved because of its wide use by many researchers in the field of health in other countries. The research data was collected through observations, literature review, focus group discussion, and brainstorming for the purpose of scoring the potentials of insured errors in the process of referral system during last year. Findings: The findings of the study revealed that the highest and the lowest risk priority number in order counted for "receiving the services from a noncontracted paraclinic" (25.7%) and "visiting a family physician who does not support the area" (13.94%). Conclusion: As the results indicate, most errors in the referral system are related to the patient (the insured person) and the high percentage of his visits to a higher level healthcare system. So, family physician is to suggest a higher level of health system only in necessity, because in the case of visiting the second and third levels directly, many resources will be wasted. Introduction: Disaster occurs almost daily in the world and increases the issue of it because of high volume of population, industrialization, and acts of terrorism; my country is one of the most unexpected event areas of the world. Healthcare systems encounter special challenges in disaster management, that they include triage and treatment a large number victims and also victims' information management. To ensure correct way of documentation of victims as introduction information management and effective triage and treatment, useful medical record are necessary, because medical record usually used for patients are too complicated and ineffective to use in case of emergency. Objectives: The objective of this research is design the disaster-victim medical record to document and triage easily for victims in disaster. Materials and Methods: This research is an applied study and has been performed as descriptive study. Source of information is libraries and accepted articles in indexed journals. During survey of corresponding organizations about disaster in Isfahan and absence of a medical record for documentation of victims, researchers identified the organizations of disaster in the world and then gathered necessary data elements for medical record in disaster. Then necessary parameters for the medical record extracted from American and European models. Results: According to situation and standards of Iran, a proper and final pattern designed with assisting management and medical emergencies center in Isfahan province. Discussion: Medical record in disaster relief operations must be simple and useful; medical record used in hospitals is not effective. The proposed model is simple and proper form for documentation of victims and easy reference for accessing clinical, administrative, and statistics information in disaster. Background: Evaluating the performance in clinical governance activities requires specific and appropriate national indicators. The aim of this study was to develop clinical governance performance indicators in dimensions of risk management and clinical effectiveness using viewpoints of healthcare staff who were working in various hospitals in East Azerbaijan, Iran. Materials and Methods: Through an extensive literature review, 135 indicators were selected for assessment by using comments of the staff working in all 41 hospitals of East Azerbaijan. Two hundred and eighty-eight people participated in four sessions in National Public Health Management Center (NPMC). Participants evaluated the indicators through 36 Focus Group Discussions. Through their discussions they completed predesigned forms with respect to title of indicators, methods of calculating the indicators, total score of importance and its feasibility, data collection method, data sources, and the level of indicator's evaluation. Results: Patients' safety and cardiovascular care unit (CCU) each by 16 indicators had the highest number of indicators. Pathology, ophthalmology, and radiology each by three indicators had the lowest number of indicators. The median score of the importance and the feasibility were both calculated in eight. Only 36.3% of the indicators were collected from hospitals. Most of the suggestions for gathering the indicators were from medical records and hospital information system (HIS), supervisors, statisticians, and admissions department. Sixty-nine indicators were designed by the participants that patient's safety had the highest number of them. Conclusion: A total of 204 indicators were evaluated and proposed by hospitals staff and stakeholders in clinical governance that can be useful in the quality of hospitals services promotion. Introduction: The first objective of crisis management is to minimize loss of lives and damages caused by the disaster. Hence, health management is an integral part of the crisis management in disasters. Several organizations are involved in health management in disasters among which hospitals are very important ones. This study aims to determine the readiness of training hospitals in Sanandaj city to face crisis and the evaluation of passive defense in them in the summer of 1391. Materials and Methods: This is a cross-sectional study and the statistical population includes all training hospitals in Sanandaj city. Questionnaires were used as the main tool to collect data. The validity of data was verifies according to previous studies and the reliability was confirmed using Cronbach's alpha coefficient. The questionnaires were answered by the hospitals' crisis committee. Data collected were first processed by Statistical Package for the Social Sciences (SPSS) and then, were illustrated using available methods in descriptive statistics including tables and charts. Results: Of three hospitals studied, Be'sat Hospital readiness in facing crises was the best (83.4% favorable, 16.6% in development), and Quds Hospital had the worst situation (36.7% favorable, 47.2% unfavorable, 16.1% in development). Conclusions: Given that the complete performance of organizations like hospitals is necessary in crisis, arrangements should be made to establish systems such as drugs supply systems and equipments, alternative communication system, ambulatory operating rooms, and personnel call systems. Background: Natural disasters are extreme geographical fragmentations with a high severity which can have catastrophic economic, social, and environmental impacts. Damage to the infrastructure can severely impede economic activity. Iran is a country which is highly susceptible to natural disasters and because of the unpredictable nature of the disasters, it is essential to be prepared for them. Objectives: The present study aimed to investigate the status of disaster preparedness in the hospitals of Shiraz, Iran. Materials and Methods: The present descriptive, cross-sectional study was conducted in nine government and six private hospitals of Shiraz, Iran. The study data were collected using a self-administered checklist through observation and interview. The checklist included 220 yes/no questions in 10 domains of emergency (30 questions), admission (24 questions), evacuation and transfer (30 questions), traffic (15 questions), communication (16 questions), security (17 questions), education (17 questions), support (28 questions), human workforce (21 questions), and leadership and management (22 items). Scores 0 and 1 were given to "No" and "Yes" choices, respectively. The validity and reliability of the checklist was confirmed in this study. Then, the data were analyzed through the Statistical Package for Social Sciences (SPSS) software (version 16). Results: Overall, the relative mean of disaster preparedness in the study hospitals was 62.3%. The highest and the lowest scores of the disaster preparedness were related to emergency and evacuation and transfer domains, respectively. Conclusion: Although the disaster preparedness in the study hospitals was good, they were not well prepared in some domains, such as evacuation and transfer, traffic, communication, and security; therefore, plans are needed to be developed in these regards. Introduction: The aim of this study was to review the current status of health in disaster related published studies in Iran. Materials and Methods: In this bibliographic study, Iranian national scientific databases were searched by using relevant terms. The articles' titles were extracted independently from each database. Then articles were evaluated by two researchers separately in terms of the study objectives including topic, theme, authors, year of publication, type of study, and phases of disaster. Results: The search for 26 keywords led to 10,805 papers. 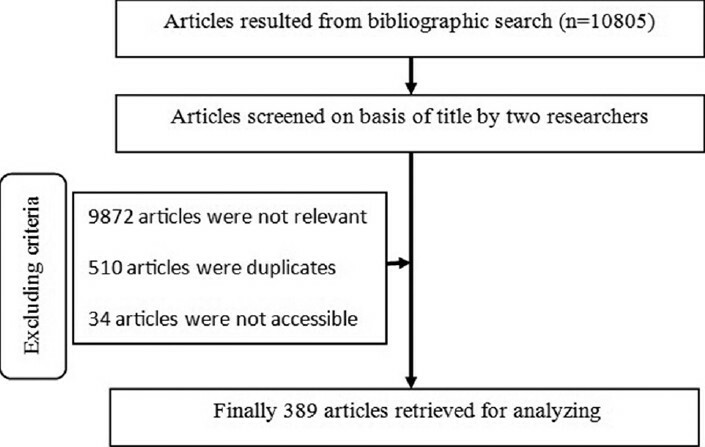 Of these, 389 articles met the inclusion criteria of the study in which 1,152 authors participated. The average number of authors per article was 2.9. The methodologies of 20.5% of articles were review papers, 43.6% were cross-sectional, and 4.6% were case-control papers. The articles were published in 140 journals. Analysis of articles by topics showed that 27.8% were on earthquakes, 22.1% on floods, and 4.3% on drought. Analysis of articles by topics showed that 25.7% and 22.6% of papers were on the response and preparedness phases, respectively. Conclusion: The publication of disaster related articles has been growing in recent years, but the majority of health issues in disasters has not been considered seriously yet and requires further attention. Objectives: To survey the attitudes, awareness, and practice of evidence based medicine (EBM), and to determine the barriers that influence application of EBM in therapeutic process among clinical residents in Iran. Materials and Methods: A cross sectional survey was conducted during September to December 2012 at the teaching hospitals of Tehran University of Medical Sciences among 79 clinical residents from different medical specialties. A valid and reliable questionnaire consisted of five sections and 27 statements were used in this research. Most respondents (90%) completed the questionnaires voluntarily and anonymously. We inserted the data into Microsoft Excel 2007. Data were analyzed using Statistical Package for Social Sciences (SPSS) 16.0 software. We applied Spearman and Mann-Whitney test for correlation between variables. 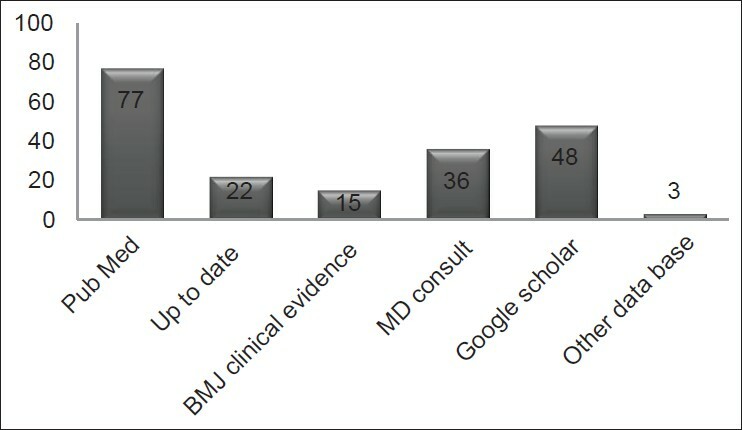 Results: Knowledge of residents about EBM is low and their attitude towards EBM was positive, but their knowledge and skills in regard with the evidence based medical information resources were mostly limited to Google Scholar. Lack of enough time to practice EBM and unperfect access to data bases were the main barriers. There was no significant correlation between residency grade and familiarity and use of electronic EBM resources (Spearman, P = 0.138). Conclusions: It is essential to improve their knowledge, skills, and capabilities to practice EBM. They can conduct EBM that should reduce medical errors and faulty diagnoses. Integration of training approaches like journal clubs or workshops with clinical practice is suggested. Background: One of the efficient uses of national resources in countries is the development of medical tourism. The number of patients who are travelling from developed countries to third world countries for medical reasons is increasing. Using the marketing mix elements is one way to attract these patients. Materials and Methods: This study was a descriptive, analytic, and cross-sectional one. The research community included all the public and private hospitals of Shiraz among which, seven public and nine private hospitals were studied. The study data were collected through a researcher-made checklist whose face and content validity was confirmed by the experts. Then, the data were entered into the Statistical Package for Social Sciences (SPSS) software and the statistical tests such as t-test, Mann-Whitney, Kruskal-Wallis, and Pearson were used for data analysis. Results: The study findings showed there was a significant difference between public and private hospitals in price and promotion mix (P < 0.05). These hospitals in the other mixes, had no significant difference (P > 0.05). Conclusion: Identifying the strength and weakness points of hospitals can help health service managers to succeed in attracting medical tourists by use of hospital strengths and decrease the weaknesses. Background and Aim: It is impossible to deny the threats and risks endangering the process of health care when offering the services. Confirming this fact does not mean ignorance the risk, or allowance to medical and nursing mistakes to happen; however, it can mean approaching the problem to come up with practical solutions and minimize the risks in the process of providing health care services. The present study was conducted periodically as an applied multi-stage research. Materials and Methods: To do a model of clinical risk management, different authentic texts on risk management in health sector were reviewed focusing on the models available. All such models were tabulated, analyzed and compared together which resulted 62 primary variables. The variables were, then, validated being used in a questionnaire responded by 20 nurses and doctors which, this time, produced a confirmed questionnaire of 40 variables. After that, 215 subjects chosen through a random and a stratified sampling were asked to respond to that questionnaire, making an exploratory factor analysis as well. Results: This study was done ,using principal components analysis as with a rotation of Varimax loadings showed a variety of factors (19 factors) available in the models of clinical risk management were loaded as "organizing and policy-making" factor. This factor illuminated a sum of 25.3% of variances in the model of clinical risk management. The results also showed the loading factor of variables as among 0.5 and 0.7 which indicated a fine correlation among them and the participants' view. Conclusion: It was concluded that "the best care of the patient is accepted as a common perspective in organization" and "the effect of the treatment team's clinical performance on their financial payments" are the most and the least important variables respectively with 0.739 and 0.548 as factor load.